University of British Columbia, 1995, M.A.Sc. University of Babes-Bolyai, Cluj, Romania, 1990, M.Eng. Electrochemical science and engineering are at the forefront in many technologies focusing on alternative energy sources (fuel cells, batteries, supercapacitors), pollution control of gaseous (e.g. CO2, NOx) and liquid effluents and environmentally more sustainable chemical process development (e.g. the electrosynthesis alternative to conventional thermochemical processes). The commercial development of many electrochemical systems, including a variety of fuel cell types and batteries, pollution control and electrosynthesis, is hampered by kinetically sluggish electrode reactions. The mission of our research program is to discover and investigate selective, durable and cost-effective electrocatalysts and to integrate the catalyst structures with the electrode and cell design in order to develop high-performance electrochemical devices and processes. 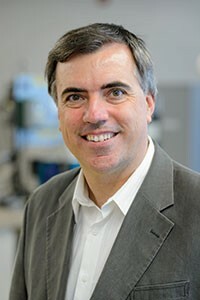 To accomplish our mission we deploy a multi-pronged approach combining fundamental experimental electrochemical and surface science studies of the electrocatalytic activity with theoretical insights into the catalytic activity, development of methods for nanostructured electrocatalyst deposition on electronically conductive 3D substrates and electrochemical cell and reactor engineering advancements. The oxygen reduction and evolution reactions (ORR, OER) are two of the most important reactions in electrochemistry with myriad of applications. We developed a class of doped/intercalated MnOx catalysts that are suitable for a range of applications such as: alkaline rechargeable metal-air (e.g., Zn-air, Al-air, Li-air) batteries, water electrolysis, regenerative alkaline fuel cells and oxygen depolarized cathodes for electrosynthesis. A company was founded to commercialize these and other catalysts: www.catalystsquare.com. E. Gyenge, P. Hosseini-Benhangi, ‘An Oxygen Electrode and a Method of Manufacturing the Same’ US Patent App. 2,940,921, 08/30/2016. P. Hosseini-Benhangi, M.A. Garcia-Contreras, A. Alfantazi, E. Gyenge, ‘Method for Enhancing the Bifunctional Activity and Durability of Oxygen Electrodes with Mixed Oxide Electrocatalysts: Potential Driven Intercalation of Potassium’ Journal of The Electrochemical Society, 162 (12) F1356-F1366 (2015). Graphene has tremendous potential for applications in alternative energy systems. However, its production is still problematic and some of the common methods involve harsh and aggressive chemicals that are misaligned with its ‘green technology’ image. We developed a ‘green’ method for simultaneous anodic and cathodic electro-exfoliation of graphitic precursors in ionic liquids for production of high-quality and high-concentration graphene micro-flakes. The graphene micro-flakes showed excellent results in microbial fuel cell anodes and as microporous layers in PEM fuel cells. A.Taheri Najafabadi, E. Gyenge, ‘Synergistic production of graphene microsheets by simultaneous anodic and cathodic electro-exfoliation of graphitic electrodes in aprotic ionic liquid electrolytes’ Carbon 84, 449-459 (2015). A.Taheri Najafabadi, N. Ng, E. Gyenge, ‘Electrochemically exfoliated graphene anodes with enhanced biocurrent production in single-chamber air-breathing microbial fuel cells ’ Biosensors and Bioelectronics 81, 103-110 (2016). Borohydride has the 2nd highest theoretical specific energy density among all fuels after hydrogen. The fuel cell applications of borohydride (e.g. NaBH4) have been intensely investigated by our group. We demonstrated the first mixed reactant borohydride fuel cell using the Swiss-roll cell design, and more recently, we were also the first to investigate the borohydride oxidation in a molten eutectic electrolyte. A.Aziznia, C. Oloman and E. Gyenge, ‘Experimental advances and preliminary mathematical modeling of the Swiss-roll mixed-reactant direct borohydride fuel cell’ Journal of Power Sources 265, 201-213 (2014). A.Wang, E. Gyenge, ‘Borohydride electro-oxidation in a molten alkali hydroxide eutectic mixture and a novel borohydride battery’ Journal of Power Sources 282, 169-173 (2015). The CO2 redox flow battery invented by Dr. Gyenge, uses a CO2-based redox couple at the negative electrode coupled with an inexpensive and fast electrode kinetics redox couple at the positive electrode. It is based on bifunctional catalysts and it constitutes a novel option for utilizing CO2 in a carbon-neutral loop of alternative energy storage and generation, while reducing green house gas emissions. E. Gyenge, ‘Redox Flow battery with Carbon Dioxide Based Redox Couple’ PCT Appl. WO 2017/A004705 A1, 01/12/2017. Course materials can be accessed by registered students via UBC Connect website.